These small rectifiers plug in. 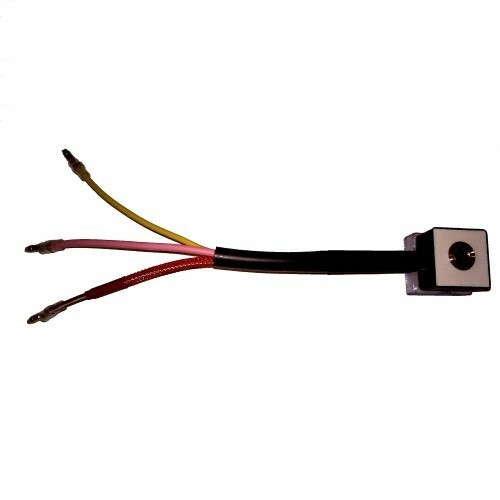 No wire connectors are involved, and no tools are needed to remove and replace the part. The original Honda rectifier was rated for 3 Amps of current. It is passing 2+ Amps of current most of the time, yet the bike can generate more power than the rectifier can pass. 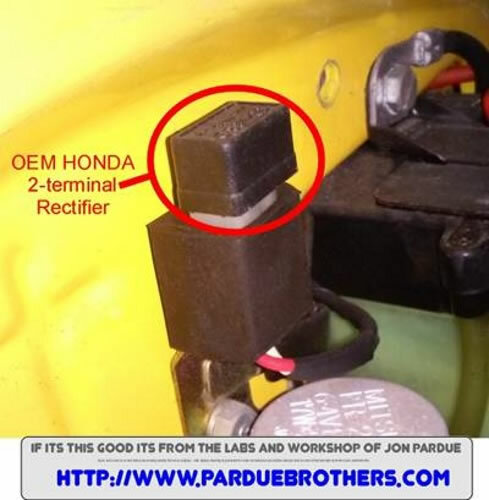 The Honda rectifier is just barely adequate, engineered and built at the lowest possible cost. 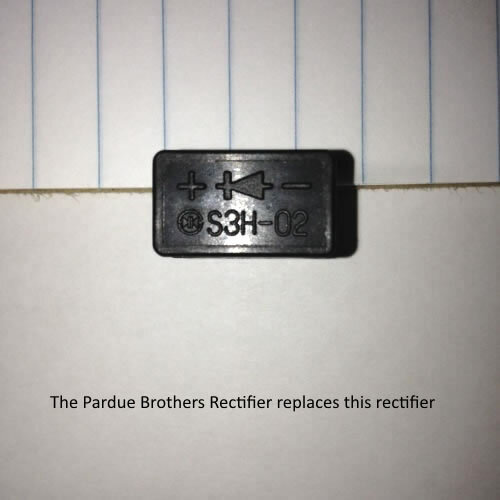 Rectifier technology has radically improved. Today a sightly larger device can pass 4 or 5 times the power, yet absorb less of the bike’s power. Technically its overkill to use a 16 Amp rectifier to do the job of a 4 Amp part, but the cost and size is barely different. Its cheap insurance to go heavy duty. Dependable peace of mind while virtually eliminating future rectifier problems is the goal. Passing more power to the battery and lights is a safety issue for many, including me that designed it! The modern rectifier delivers. Another rectifier rating is reverse Voltage. Think of it as a pressure rating for garden hose. 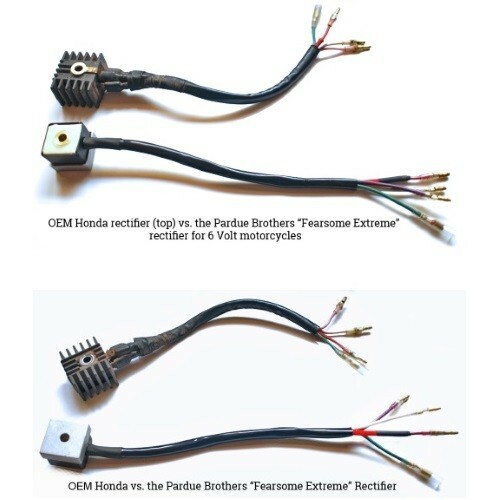 The original rectifier had a 50 Volt inverse rating, yet these bikes make brief 200 to 300 Volt spikes. 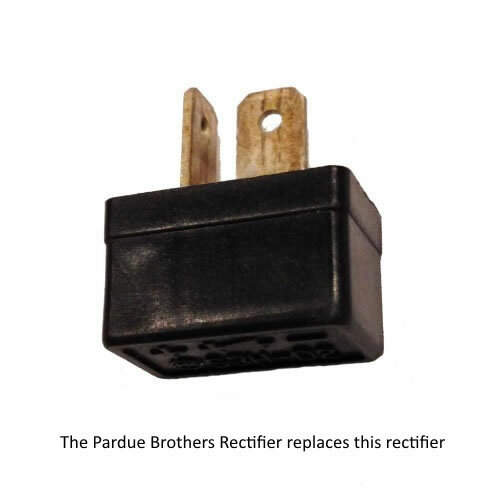 The modern rectifier can be rated for 1,000 Volts or more. A rectifier is an automatic valve, quickly switching electrical power flowing back-and-forth, to flowing in one direction. The valve uses electrical power to work, making heat in the process. Modern rectifiers are far more efficient. 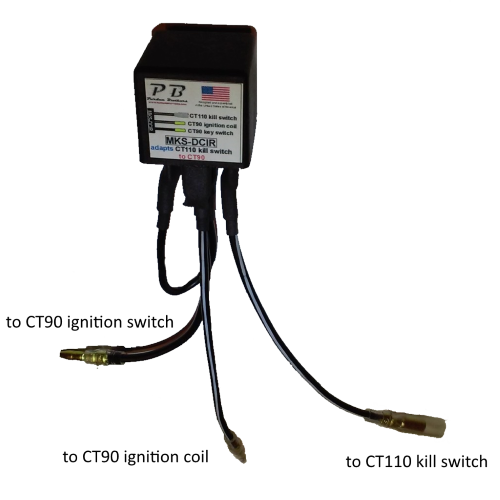 Bottom line, a little more Voltage is delivered to the lights and battery at all engines speeds. Pulsing, alternating electricity is generated as the engine runs. This AC power is great for light bulbs, but bad for charging a battery. The rectifier serves as a one-way valve to make the battery happy. The battery is a chemical processor pushing electrons one way through it. 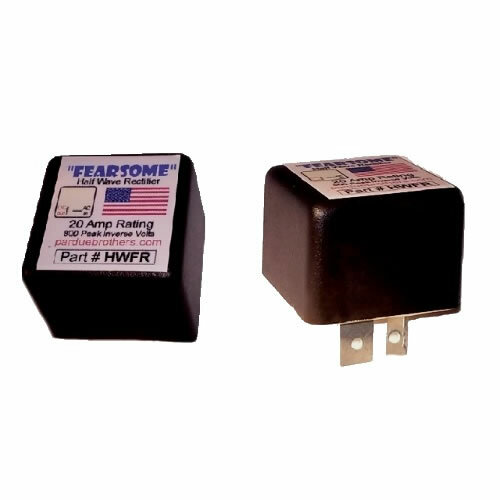 Our Fearsome Extreme half wave rectifier plugs in. 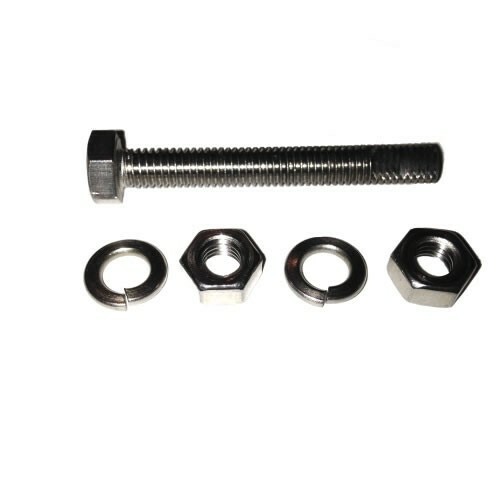 It is a little larger due to the heavier duty components inside, but does not interfere with anything. 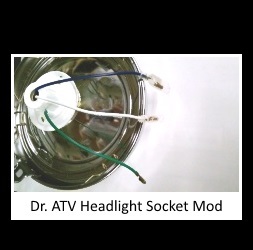 It is rated to pass 16 Amps at 800 Volts. Your bike needs to pass 3 or 4 Amps at 8 Volts. This is meant to be the last rectifier your bike will need. Its not built of the lowest cost parts, just the best parts.